...may have put a damper on his day, but it didn't keep him down. 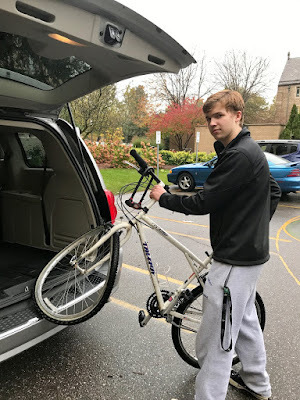 Yes, Jack Usher, Steds freshman, was involved in a two bicycle crash. Jack was stopped, waiting for someone else to pass in front of him, when another bicyclist, who saw Jack stopped, kept peddling like a rider in the last stage of the Tour de France... and bang. The other bicyclist crashed into Jack. Thankfully, Jack was not injured though his front wheel was completely demolished Still yet, both Jack and his bike will make full recoveries. On the accident, Usher said, "Fixing a bicycle is expensive, but having a few extra minutes of sleeping in the morning is well worth it."